All along we were planning a city hall wedding to make things easier on us. It's purpose was so that we didn't have to get a legitimate officiant when it came to the wedding ceremony in September. I was given more ideas for the civil ceremony after seeing a bride (Miss Jellyfish) from Weddingbee's city hall marriage. Two things in particular stuck out about her ceremony that I just adored. 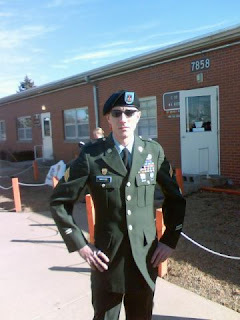 First, her hubs was in his dress blues. I myself wanted future hubs to wear his Class A's for our September wedding. But as always, he doesn't want to be seen as a soldier. He wants to be known and loved for who he is rather than his 8yrs of service to the country. Despite turning down the idea of wearing the Class A's for the wedding, he was open to the idea of wearing them for the civil ceremony. I've been overjoyed by this compromise as I just love seeing him dressed in uniform with his salad on his chest... yes, the mix of ribbons and metals are nicknamed a salad. =) Plus this is one of the few times he will be allowed to wear them as retired military. Second, Miss Jellyfish had pro photographers (the elly's friends Andrew and Amy) there as well. This gave me yet another lightbulb moment during my week of wonder. We are due to have my friend Kelly take our engagement photos in May. But in all honesty we don't need engagement photos. They are nice, lovely and traditional but nothing about us is traditional. 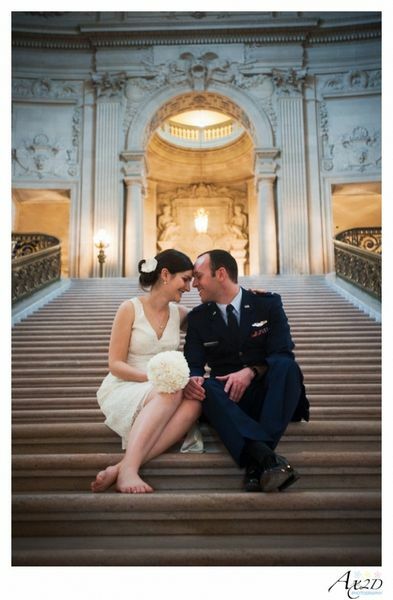 And while we may like such photos, I think we would be better served having someone document our city hall marriage. So I proposed to future hubs that we get married in May rather than mid-summer. We would work around Kelly's schedule to find the date and as my sister/mother work in downtown, we could call them to come out during their lunch break to witness. After the wedding, we could get some photos at Point state Park/Ft. Pitt then walk across the bridge to a neat little art installation for more pictures. As long as it's the same amount of photos and time as an engagement shoot would be, I don't think Kelly would object. Heck, I don't think she'd object either way as she's such a sweetie. Josh was fine with all of this but then brought up that he should invite his mom up as if he didn't, he would never hear the end of it. ***Instant panic attack*** His mom... not that I didn't adore her when we first got engaged and don't want to like her now... but she's gone a bit nuts over the last year and has caused a lot of unnecessary drama. The only reason I first thought to invite my sister and mom was out of convenience. We could easily have any of our friends come to witness but those two are in the city and could come at a moments notice. If his mom is invited and she can't make the chosen day, I can see it turning into her trying to get us to move the date to suit her. Also if we invite her, that means we need to invite our entire family who also might have day conflicts. Inviting the dads, moms, step-moms and all the sibs turning a small city hall union involving 5 people into a huge event. It's not that I don't want our family there, I do. But by inviting the family to this, we invite chaos as well. I want his mom to have the opportunity to come, but I also don't want this to turn into the huge chaotic cluster f@#& that our wedding in September is going to be. 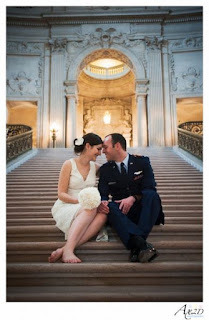 This city hall wedding is for us... it's our simple ceremony with meaning. It's our legal union because we want to be with each other for the rest of our lives in the rough and patchy moments along with the moments of joy. The big ceremony looses all of that because it is just that... A big ceremony. It's full of pomp and circumstance. It's full of being friendly with relatives and friends you haven't seen in years. It's being pulled 5 different ways and not being able to take a breath. I love our families but don't want the small ceremony, initially hidden from family as it was to be just for legal purposes, turned into a 3 ring circus. I want it to be a day about us with just us and not a whole entourage. If there's a whole entourage then the simple pictures in the parks are out and then it's not just basking in the moment but dealing with ALL the relatives. Anyone else have your simple dreams somewhat complicated in a pinch?